If you've never rowed on the water, we encourage you to give it a try! The exhilaration of feeling the boat move under your own power is well worth it. Read on for more information about where you can try on water rowing. Each year in early June, rowing clubs around the country offer introductory rowing lessons to the public. The activities vary from club to club, but the day generally includes coaching on the Concept2 Indoor Rower and a chance to row on the water. You'll also be able to pick up information about the rowing opportunities available in your area. To find the Learn to Row Day event nearest you, or to learn more about hosting a Learn to Row Day event, visit usrowing.org. 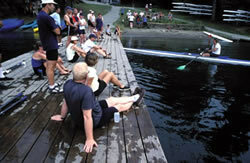 Many locations offer rowing camps for both youth and master rowers. Refer to the table below for details, and be sure to also check out the camp list at row2k.com. If you offer a camp and would like to be added to the list, please send a short description, including location and contact information, to rowing@concept2.com. Albany Rowing Center’s youth summer rowing camp program offers instruction in rowing to students entering 6th to 12th grade (ages 11 to 18). For athletes looking for something new, this coed camp is a great way to find out if rowing might be a good fit. ARC teaches young athletes about the sport of rowing through participation in a fun and educational setting. Students will learn water and boat safety, stroke mechanics on the ergometer (rowing machine) and the basic techniques of sweep rowing and sculling on the Hudson River. While the majority of time is spent on the water, there is also fitness training on land and education about boats and equipment. Campers learn how to work as a team. No prior experience necessary. ARC also offers Adult Learn-To-Row programs throughout the spring and summer. This program is for adults interested in learning the basic techniques and styles of sculling and sweep rowing. The program is a low impact sport available to adults of all athletic levels. The learn-to-row program includes instruction on land as well as on-water sessions to learn basic rowing technique. For more information, including dates, times, and fees, visit: www.albanyrowingcenter.org/summer_camp.php. The 2014 Indiana Rowing Camp caters to both beginner and experienced rowers and coxswains age 13–18. IU Head Rowing Coach Steve Peterson and his staff offer a challenging, fun, and rewarding experience where beginners learn fundamental skills and experienced athletes focus on technique development and performance. Learn why rowing is the ultimate team sport! For more information, visit www.hoosiersportscamps.com. Penn AC Gold provides the most complete competitive summer experience in preparing male and female high school athletes for all aspects of collegiate and pre-elite rowing. Housing, meal plan, and all travel expenses are included in the cost of the program. The Philadelphia Sculling Club was founded in 2010 to provide an intensive racing and training program focused on Junior (under age 19) male scullers. During the summer, the program practices twice a day, five a days a week on a stretch of the Schuylkill River just outside of Philadelphia, Pennsylvania, and includes trips to USRowing Club Nationals and Royal Canadian Henley. Visit www.philadelphiascullingclub.org for extensive information including schedules, application information, and dues information. E-mail jdb@philadelphiascullingclub.org with other questions. Offering several camps each year for masters and juniors. Contact Mark Wilson at 865.441.0880 or email director@allamericanrowingcamp.com. Offering youth and adult learn-to-row sessions throughout the spring and summer, on the shores of Lake Ontario, in the sheltered water behind the Toronto Western Beaches breakwall. Offering lessons and rentals from May 1–Sept 30. Reservations must be made in advance. or write 43 Roselyn Drive, Pittsfield, MA 01201. Brock has been offering lessons in sculling and sweep rowing since 1994 on the world famous Royal Canadian Henley course in St. Catharines Ontario. We offer lessons and coaching for all skill levels; introductory to advanced, and all ages; 12–80 years old. For more information contact Peter Somerwil psomerwi@brocku.ca or go to our website at www.brocku.ca/rowing. A program designed for designed for all ages and levels of sculling. Offering sculling and sweep classes and programs for high school, college and masters levels during the spring, summer and fall. Find out more information at www.csusaquaticcenter.com. Calm Waters Rowing offers a full-service sculling camp vacation catering to the master's rower. The Camp is "The Perfect Sculling Destination." Whether you are a beginner, recreational rower, or experienced racer, our rowing camp will focus on your needs. Our camp is designed for girls aged 13–18 with OR without any rowing experience. Come spend a week with us on the beautiful Chester River—we are close to DC, Annapolis and Baltimore. Sign up early to ensure a space! Visit our website at www.crew-camps.com or call 410.810.2643. The Maine Rowing Camp is a comprehensive and enjoyable rowing experience for boys and girls ages 13–18 with the backdrop of summertime in Maine. With the benefit of the full resources of Colby College and the Colby College rowing program and with the help of coaches from top programs around the country for campers to learn from, hundreds of young men and women have come to the Maine Rowing Camp to hone their skills or to learn the sport for the first time. Campers are placed according to both age and experience level, and our athlete/coach ratio of 10:1, along with the daily specialized instruction geared just for coxswains, allows each camper the chance to significantly improve their understanding of rowing and to do so in a relaxed, enjoyable environment. For more information, contact Stew Stokes at smstokes@colby.edu or 207.859.4942. The oldest sculling camp in the nation, Craftsbury remains one of the definitive training locations and experiences for scullers worldwide. For nearly three decades, beginners and Olympians alike have returned season after season to train with our world-class coaches in a setting of unrivaled natural beauty. May to September; week, weekend, and four-day camps. Camps in some of the finest rowing locations around the world. CRC Sculling Camps caters to all levels of participants and many of our camps operate throughout the winter months usually in warmer climates. We have been in operation for seven years and provide expert coaching and tuition for all. A beautiful location with calm water canal access for Learn to Rows and technical instruction and the Detroit River and Lake St. Clair for all out power and distance rowing. Offering sculling and sweep classes and programs for middle school, high school, college and masters levels during the spring, summer and fall. Aside from scheduled camps; private, semi-private and group classes are offered by appointment. Popular Ladies Weekend Rowing Retreats include a gourmet Saturday lunch and Sunday breakfast served on china and optional yoga in the historic Lawrence Fisher Mansion. Indoor rowing programs year round. 3 one-week courses/camps in July/August every summer. Running since 1990, now more popular than ever before. Use of Eton's huge fleet of boats—over 400 in total, every type of rowing/sculling boat, even Dragon Boats! 3 sessions/day intermixed with a range of thoroughly enjoyable non-rowing activities—no less than 99% of last year's intake want to come back! *Overseas students please note: Eton is < 20 minutes from Heathrow airport, and students can book for 2 weeks if 1 is not enough! Offered by Hampton Roads Rowing Club, this camp is geared toward experienced high school rowers. There will be a high rower to coach ratio with a maximum of only 15 rowers and 3 coxswains to be accepted. Applications to the camp are available on www.hrrc.net and only the best qualified applicants will be accepted. Sorry, no lodging is available for this camp. All sessions will be held at the Norfolk Community Rowing Center at Lakewood Park in Norfolk, VA. Questions can be referred to Rob Reali 757.362.4022 or at regattadirector@hrrc.net. Xeno is an Olympic gold and silver medal winner in the men's single scull. Come join him at the IRON OARSMAN, a one-of-a-kind indoor rowing studio. In a welcoming environment, participants will be shown how to maximize their rowing stroke. Camps are open to people of any ability who want to improve their stroke on the rowing ergometer. On completion of the three workouts, each participant will get video footage of their rowing sent to their home. Two Sessions. Eligibility: Girls and boys 13–18 years of age are welcome regardless of experience or ability. The only requirement is a desire to improve. Camps for youths ages 13–18 are appropriate for everyone from beginner to highly experienced. Sessions run in June and early July. Boys: visit website at www.navycrewcamp.org or call 410.293.3636. Girls: visit website at www.navyrowingcamp.com or call 410.293.2419. Boys & girls ages 14 and up. Thirteen locations around the U.S. Call 800.NIKECAMP. This one week sweep rowing camp in Raymond, Maine is for junior athletes ages 14–19 with at least one season of experience. Established in 1987, Northeast has been providing excellent quality instruction for over 25 years. For information, call 609.712.2667 or email us at email@RowCamp.com. Instruction weekends and some weekdays. Call 415.332.1091 to register. Novice to advanced. Year-round. ORC is offering a Men's Junior Development Training Camp for male varsity rowers 18 and under. Camp will be held at the ORC boathouse on Lake Fairview, Orlando, FL. For more information contact Coach Chris Pucella at pucellc@ocps.net or at cpucella@cfl.rr.com, phone: 407.468.9469. The Peter Jay Sharp Rowing Club in New York City seeks highly motivated athletes for its competitive senior team development camp. Are you looking for a rowing camp to improve your skills, enable you to enhance your physiology and make you a better racer? The Princeton High-Performance Camp is for you. Each rower will be comprehensively analyzed through the use of video, ergometer, and in-boat racing situations. For girls and boys ages 14–19. On-water real-time power curve analysis, private lessons with top US coaches, computer-aided video analysis, long-term physiological analysis and consulting. Personalized rigging clinics, race strategy, counciling, beginner lessons and more. TeamSur's Rowing Camps in Spain and Portugal are custom designed for teams and clubs of all ages and skill levels. Train at the world renowned Seville High Performance Rowing Center, considered one of Europes finest rowing installations, enjoy excellent lodging accommodations, impeccable trip organization and the colorful culture and hospitality of the Spanish and Portuguese people for the perfect team rowing experience. The original, the best: this is where the concept of "rowing vacations" was born! Rowers are well-traveled, curious, and easy-going, and it is our great joy to be able to share our rowing haunts with others. In Tuscany, we train on our secluded rowing basin, go for a row under the Ponte Vecchio in Florence, and absorb the true sense of Tuscan culture. Every day we'll be on the water, working on perfecting the essentials of our rowing technique, and then we'll take off exploring the countryside and towns. Showing our guests what we love is a wonderful excuse to see them ourselves! All the passion and love of travel & rowing that we put into our Tuscany experience also goes beyond to Sicily, China, Venice, Quebec , and anywhere that's fun to row! We take you to local rowers who are delighted to share their passion with others, we coach you on the ocean, rivers, lakes or basins... anywhere where rowing is a daily activity. And we combine our workouts, as always, with terrific local food, culture, and day trips. The University of Michigan's Summer Rowing Camp invites girls and boys, ages 13–18, to attend rowing camp in Ann Arbor, Michigan in late July. Rowers and coxswains—ranging from top-level juniors to campers new to the sport—will be grouped based on skill levels during rowing sessions. All campers will be coached by the University of Michigan's Women's and Men's Rowing coaches. Campers, parents and guardians, and coaches can find more information about Michigan Rowing Summer Camp online at www.michiganrowingcamp.com. Open to girls in or recently graduated from high school. Rowers and coxswains welcome with or without experience. Two Sessions. Location: Madison, WI in the University of Wisconsin's boathouse and dormitories. Registration materials available from: Carrie Davis 608.265.8677 or e-mail: cbd@athletics.wisc.edu. We have Juniors and Learn To Row sessions. Please call Don Wadsworth 316.688.0690 or don.l.wadsworth@boeing.com for registration details. William and Mary Rowing Club is offering a seven-day overnight rowing camp for both boys and girls to learn more about the sport of rowing at the beautiful College of William and Mary. Our camp is for rowers and coxswains with at least one semester of sweep rowing or coxing experience who want a competitive edge for high school rowing as well as future collegiate-level racing. Students will be fully supervised by our staff and given personal guidance from W&M Rowings own head coach, Nathan Walker. There are only 30 slots for boys and 30 for girls, so spaces will go fast; first come, first serve. Our website is at www.wmrowing.org/camp. Please direct any questions to Cassandra Adair, student director, at ccadair@wm.edu or Coach Walker at williamandmaryrowing@yahoo.com. Camp Randall's primary purpose is to foster national and international rowing by supporting and developing amateur athletes for national and international competition in the sport of rowing. www.camprandallrc.org. An 8-week sport-specific strength and ergometer training program for high school and junior rowers. This program is land-based only, designed to improve a rower's strength and aerobic capacity. Testing and benchmarks are used to establish and monitor each rower's level of fitness. The Brigantine Rowing Club also offers on-water rowing classes for juniors to masters. For more information, please call 609.226.6883 or visit www.rowmax.us. Offering adult Learn-to-Row-for-Fun-and-Fitness and open water rowing clinics on Salem Sound (17 miles north of Boston; convenient to Logan International Airport). Private coaching for novices to competitive rowers training for open water rowing competitions. Clinics and private coaching run May through October. Shell rentals to qualified rowers. Year-round and seasonal private boat storage. For weekend learn-to-row intensives, list of lodgings in historic Marblehead, Massachusetts, and more information, contact Maryellen Auger. Email maryellen@rowingforall.com, call 781.990.3552 or visit www.rowingforall.com. At our location along the beautiful Susquehanna River in Central Pennsylvania, we strive to provide a one-of-a-kind sculling experience. Sessions run June–November. Groups are small for a personalized experience. If you are passionate about sculling, or would like to develop a new skill, this is your ultimate sculling vacation. World class coaching, equipment and accomodations are included. For more informaiton, email info@riverbreezerowing.com, call 888.TWO.OARS or visit the website at www.riverbreezerowing.com. Porter's Rowing Academy will be offered to girls in grades 7–10. Porter's Summer Sports Academy utilizes the athletic environment to assist in the development of tomorrow's leaders. Our goal is to create a safe and challenging environment for the female athlete that cultivates the development of the whole athlete. Through the utilization of state-of-the-art athletic facilities at Miss Porter's School, instruction from some of the country's premier coaches, guest speakers, and special workshops, our participants can't help but grow as athletes and individuals. Having formed new and lasting friendships, they will depart as athletes who are technically cleaner and tactically more aware, ready to return to their teams with more confidence and a better understanding of what leadership role they can play to improve the overall team dynamic. Program details are available at www.porters.org/summerprograms. Email: summer_programs@missporters.org. Join us this summer at the Oklahoma City National High Performance Center for a training experience that will inspire you to pursue your highest goals. Take your training to the next level at the Oklahoma City National High Performance Center Juniors Camp. This challenging week-long residential camp for experienced junior rowers will provide all campers with an opportunity to train at the same premier urban aquatic venue utilized by the U.S. National Team. Visit http://usrowingokc.org/camps/juniors/ for more information and to register. Open to middle school, high school and college students. Sag Harbor Community Rowing summer rowing program is a non-competitive rowing program designed to improve your technical proficiency and aerobic base and get you ready for next years racing season. Weekly sessions begin on Mondays and go to Friday for the months of July and August. You may sign up for as many weeks as you want. Eligibility: Must be 9 years of age or older. No prior rowing experience is necessary. Adults are welcome! Visit http://www.rowsagharbor.org/ for more information and to register. For high school girls, aged 13–18. Learn from University of Virginia coaches at one of the most beautiful and protected bodies of water in the country. Both sweep rowing and sculling will be offered with an emphasis on technical development. Erg training, core and stabilization will also be featured. Visit abcsportscamps.com/uvarowing for more information and to register. Target: Rising seniors interested in the "life of a college athlete." This is not for novice rowers, but rather to develop technical skills on the erg and on the water. The Pocock Rowing Center is Seattle's premier rowing facility! We have learn to row options for adults and children happening monthly, and a number of summer camps designed to get kids on the water and enjoying the sport. For class listings and information, contact the Pocock Rowing Center. For more information, visit www.pocockrowingcenter.org or email info@pocockrowingcenter.org. Summer Rowing Camps are 5 day camps with the best ratios of top collegiate coaches to athletes in the country. These camps are good for kids who are looking to explore their potential in the sport. A coxswain development camp is interlaced. Video found on site. For more information, visit: sparksconsult.com/rowing-camps/summer-rowing-camp/. For more information, visit: sparksconsult.com/rowing-camps/seattle-summer-rowing-camp/camp-overview/. This is a camp, hosted at the USRowing Training Center, where Sparks "rents" the athletes allowing the on-water focus to be exclusively on coxswain coaching. Emphasis is placed on Sparks' coxswain curriculum of Awareness, Organization, Commands, and Steering. Video on curriculum found on site. For more information, visit: sparksconsult.com/rowing-camps/coxswains-only-camp/coxswains-only-rowing-camp/. This is an advanced camp that teaches rowing specific training physiology and strength and conditioning with a goal to provide an individualized program and enable kids to safely and efficiently train on their own through the rest of the summer and beyond. Camp is hosted at Columbia University. For more information, visit: sparksconsult.com/rowing-camps/advanced-rowing-training-program/camp-overview/. The New Zealand programs are the most special and selective experience our company offers. Athletes train alongside New Zealand athletes on the junior, university, and elite levels in Dunedin or Nelson. Three five week terms available in June, July and August. Limited to 10 athletes per term; three part application process. Video found on-site. For more information, visit: sparksconsult.com/rowing-camps/why-row-in-new-zealand/. Offering junior sculling, masters sculling and competitive junior rowing camps during the summer. For more information, visit www.steelcityrowing.org, contact Dori.Tompa@SteelCityRowing.org or call 315.781.3103. The Hobart College Rowing Camp is designed for boys and girls who are either an experienced or a novice high school aged rower (ages 13–18) looking to significantly improve their rowing ability. Instruction and coaching will be geared to the experience level and talents of each rower. The camp includes two daily practices on the water as well as active seminars on rowing related topics. The staff will also lead discussions on the college admissions process and life as a student-athlete. Each session will have tiers of instruction geared toward beginner, intermediate and advanced rowers and coxswains. For more information, visit www.hws.edu/offices/conferences/rowing.aspx or email events@hws.edu. Hosmer Point is a traditional summer camp for girls and boys, which offers a sculling program. Kids aged 9–15 are taught to scull through an age-appropriate curriculum, which also allows participation in the many other enriching activities and traditions of summer camp. Hosmer Point is a program of the Craftsbury Outdoor Center, and draws on the expertise and equipment of the Craftsbury Sculling Camp. For more information, visit www.hosmerpoint.com. Mary Whipple’s goal is to create the best, most knowledgeable, and enjoyable summer camp experience where coxswains are the main focus. In Mary's words: "This is the kind of summer camp that I would have wanted to attend when I was in high school." This is going to be your chance as a coxswain to learn about the sport of rowing on your terms. Coxswains can expect to be athletic and competitive, listen to and share race recordings, learn to row, master the art of docking and steering, increase situational awareness, and most importantly become a better leader. For more information, visit www.9thseat.com/summer-camps/. The Renton Rowing Center is a community boathouse of the George Pocock Rowing Foundation. RRC Adult Learn-to-Row programs begin in April and run through September. We also offer 1-day intro classes into the sport throughout the spring and summer. Our youth team runs year round and includes programs for Middle and High School students. Our youth athletes will use rowing as a means to develop new skills, learn how to work together, and challenge academic and athletic potential. We strive to provide full support—including scholarships, transportation, swimming lessons, and mentorship—to remove barriers that limit participation in youth rowing. We hope you're able to join us on the water! For more information, visit www.rentonrowingcenter.org or email info@rentonrowing.org. We are hosting three one-week junior camps this summer as well as a five-week program. Rowers can commit by the week. Both beginners and experienced rowers are welcome. Boat skills including balance, blade work, body position, and power will all be developed. We row out of Bladensburg Waterfront Park in Bladensburg, Maryland on the Anacostia River. For more information, including dates, times, and fees, visit: www.WashingtonRowingSchool.com. We are hosting two weekend camps this January, one for novices and one for intermediate rowers. The intermediate camp session will be coached by guest coach Bob Ernst. Camps will include sessions on the water, video tape review, essentials of training, erg training, and stretching for injury prevention. Come join us on Mission Bay! For more information, including dates, times, and fees, visit: www.zlacmasters.com/camps/. Artemis Rowing is a competitive rowing program based at Oakland California’s Jack London Aquatic Center. Throughout June, July and August, Artemis is offering fun, week-long summer Learn to Row camps for students in grades 6–12. Enroll in two or more and be ready for our middle/high school teams in fall! For more information, including dates, times, and fees, visit: www.ArtemisRowingClub.org. We are a sports agency based in Banyoles, home to all rowing events for the 1992 Summer Olympics in Barcelona. We host plenty of rowing clubs, universities and federations from all over the world, and coordinate their training camps and tours in many of Spain’s top rowing venues. We provide all sorts of tailor-made packages including accommodation, transportation, and rowing logistics. Trust our knowledge and enjoy some truly great rowing experiences in Spain! For more information, visit: www.agendasports.com. Only an hour and a half away from Lisbon, Portugal, the rowing center is framed by the beautiful scenery of the Albufeira de Castelo de Bode and is equipped to provide the best possible training experience. With the support of a professional coach we will all work together to improve your technique, combining technical exercises, video analysis and physical exercises for posture. All this as you spend your days in a relaxing and welcoming environment, enjoying local gastronomy and your great passion: ROWING. For more information, visit: rowing.byx.pt.